A mature spiritual life embraces paradox. 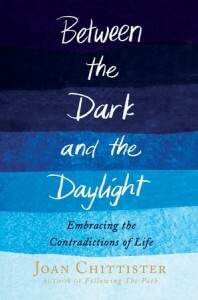 And paradox lies at the heart of Sister Joan Chittister's newest book,Between the Dark and the Daylight. The subtitle of the book is "Embracing the Contradictions of Life" but I think paradox would be a better word here. As physicist Niels Bohr put it, "The opposite of a correct statement is a false statement. But the opposite of a profound truth may well be another profound truth." It is profound truths which Chittister explores in this book, and for the most she does so superbly. Even the chapter titles reveal the almost playful tone of the book: "The Mirage of Security," "The Fragility of Achievement," "The Success of Failure," "The Creativity of Confusion," "The Courage of Cowardice." Like Henri Nouwen's concept of "downward mobility" or Richard Rohr's notion of "Falling Upward," Chittister invites us into the spirituality of Christ, where the last shall be first, the ones who humble themselves shall be exalted, and the person who loses his or her life shall gain it. This is a spirituality that is consciously counter-cultural in response to the values of "the world," that is to say, society at large: where bigger is better, faster is best, winning is everything, and losing is shameful. The problem with that way of approaching life is that, sooner or later, we all "lose." We die. We get sick. We fall victim to bad luck or a downturn in the economy or our hereditary predisposition to clinical depression. Jim Morrison of the Doors put it bluntly, "No one here gets out alive." So the question is, do we embrace the "dark" parts of life with grace, or fight it with ever-increasing desperation? Clearly, the author affirms the way of grace and acceptance and vulnerability, and the hopeful message of this book is that if we yield to the dark rather than struggling against it, we find that it has treasures galore to share with us. "Whatever it is that we harbor in the soul throughout the nights of our lives is what we will live out during the hours of the day," she notes. In other words, to the extent that we are able to "embrace the contradictions (paradoxes) and move through the dark with faith and thanksgiving, the blessings we discover there will accompany us back into the lighter seasons of life that are sure to come. Naturally, my favorite chapter is "The Noise within the Silent Self," where Chittister acknowledges how even the noisiness of "the monkey mind" can be a blessing - even to those of us who wish it would shut up long enough for us to pray contemplatively. "This noise in my is the voice of the Spirit calling me to attend to what I have long ignored or denied or forgotten." Which reminds me of Kenneth Leech, who says thatcontemplatives encounter the chaos in their own being when they pray. "Silence is the gift that throws us back on ourselves," proclaims Chittister - suggesting that, if we accept the inner noise with a listening heart, even it can be a blessing, for it calls us to places where we need healing, or empowerment, or transfiguration. If there's a mis-step in the book, it's the chapter called "The Courage of Cowardice." Here the author tries to challenge our "might makes right" approach to national politics and foreign policy, but when she equates the military with "child-beating" and "wife-beating" she sounds like a 70′s-era Vietnam war protester, too willing to paint her case in black and white. Insisting that a firewall separates "physical courage" and "moral courage" seems naive at best, and unwilling to acknowledge the challenges that law enforcement or military leaders face, who do not relish violence any more than you or I, but are tasked with a life-endangering mission. While I agree with Chittister that abuse of power - including military power - must always be resisted, I wish she had been a bit more nuanced in acknowledging the complexity of armed service in today's world. But that's my only gripe. Between the Dark and the Daylight makes for excellent Lenten reading, so if you haven't picked out your Lent book, it's probably not too late to pick this one up. It's insightful and thought-provoking. At the end, Chittister describes the book as an invitation to live well in the contemporary world. If that was her goal, she certainly succeeded.